It’s been nearly half a decade since the United Nations announced the global population passed the 7 billion mark. This number is ever-increasing. Research shows that the number will reach 10 billion before the year 2060. Food production levels have also risen to accommodate the increase in world population. Yet despite this, rice production is about to decline for the first time in 6 years which could spark a global food crisis. The results could potentially be disastrous. This is because not only developing Asia, but emerging markets around the world use rice as a staple food. Food Riots in The Philippines: Will it Happen Again? With the imminent danger of another food crisis, it’s worth exploring past events to understand the consequences of one. Back in 2008, El Niño led to a severe decline in Asia’s rice production, which in turn led to global consequences. India, one of the world’s biggest rice production hubs, banned exports of rice. This led to a sudden price surge of $1,000 per ton. Food riots in frontier markets such as Haiti and the Philippines followed. Manila had to crack down on hoarding. The Philippine military oversaw sales of subsidized rice and ordered fast food chains to serve half-portions. They also pleaded to Southeast Asian neighbors such as Myanmar to help them with more rice. Vietnam and Thailand: Asia’s Future Global Food Crisis? Rice production can be quite volatile and subject to slight differences in temperature due to the nature of production. Furthermore, over 60% of the global rice exports comes from just three Asian countries: India, Thailand, and Vietnam. With these three places experiencing unfavorable climate conditions this year, there’s a high possibility that rice output will be much lower. This could bring about higher prices of a staple food for half the global population. As India experiences a series of heat waves cutting its crops short, Thailand and Vietnam are also suffering similar fates. Severe droughts are hitting the two Southeast Asian nations as the trans-boundary Mekong river runs dry. The United States Department of Agriculture predicts that rice production in Thailand will drop by more than 20% to 15.8 million tons this year. 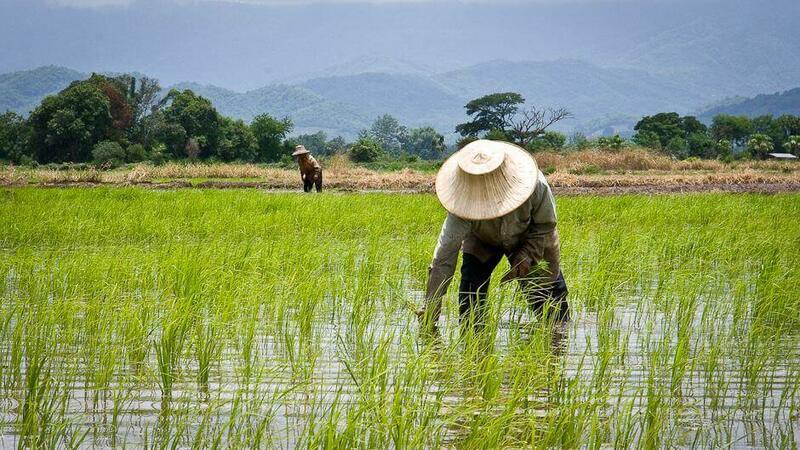 The Thai government itself has taken initiatives to help its local farmers. Thailand is suffering from a water shortage after two years of drought. As such, local farmers were asked to not plant rice crops, but to focus on other crops better suited to the current situation. In Vietnam, things are only a little better. Rice production is expected to fall by 1.5% to 44.5 million tons. The decline is directly related to the destruction of paddies caused by drought in the Mekong Delta region. Even though the government estimates a 1.5% drop, traders believe the latest harvest was about 5% lower than the same period in 2015. If the fall in production levels wasn’t alarming enough, Southeast Asia’s top importers are also buying more rice more this year. China expects to continue buying its previous year’s amount of 5 million tons, as its own rice production cannot keep up with consumption. Indonesia looks to increase its purchases of rice to 2 million tons this year. Meanwhile, the Philippines is short on rice once more despite its yearly imports. Rice prices have slowly inched forward in response to the possible crisis. Even though not at 2008’s $1,000 per ton rate, they reached $389.5 which represents a 10-month high. The world waits, watches, and carefully monitors the situation as another food crisis lingers.